Dyanite® Carbide lasts five times longer than standard carbide. 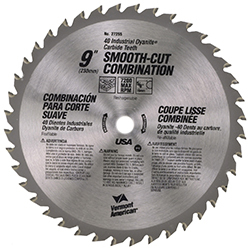 The blades are designed for continuous operation in industrial shops and feature large tips that provide longer life. Fully hardened steel blanks will not distort under heavy loads, yielding a blade that runs truer and provides more accurate cuts. Metal cutting blades are specially designed for cutting non-ferrous metals such as aluminum, copper, brass and lead. May also be used for general trimming in wood.